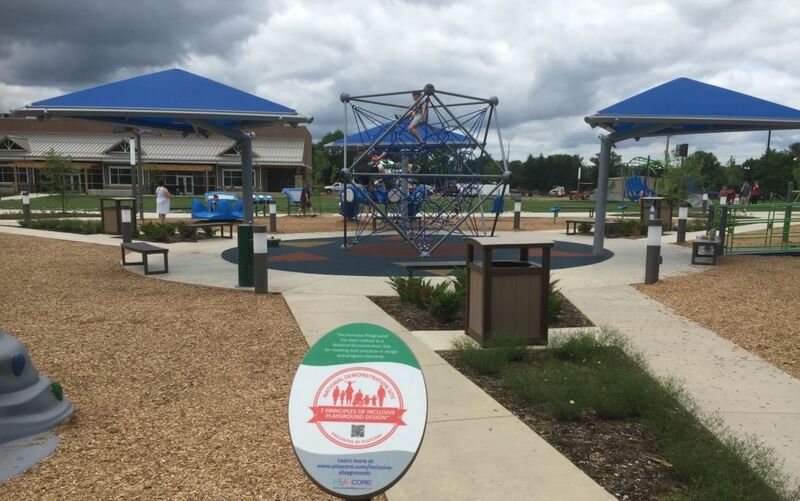 Putnam County Parks and Recreation brings the first GameTime Challenge Course to Valley Park in Hurricane, West Virginia. The Pro 3000 Challenge Course is a great way for children, adults, families and entire communities to be active and get fit together. Challenge Course combines the excitement of American Ninja Warrior with the skills of the NFL Combine in a fun, competitive environment. The Pro 3000 includes obstacle course events, a 40 yard dash, turf and timing. The play space is just as exciting as the Challenge Course! This unique designed play space is set up like a wheel cog or sundial. At the center, you will find an Omni TriNet on poured-in-place safety surfacing as the focal point. The four surrounding areas are divided up nicely into a 2-5 play area, 5-12 play area, sensory play area and swings. The 2-5 play area includes a GameTime Powerscape play structure, GT Jams Beat Club, Discovery Cave and Expression swings. 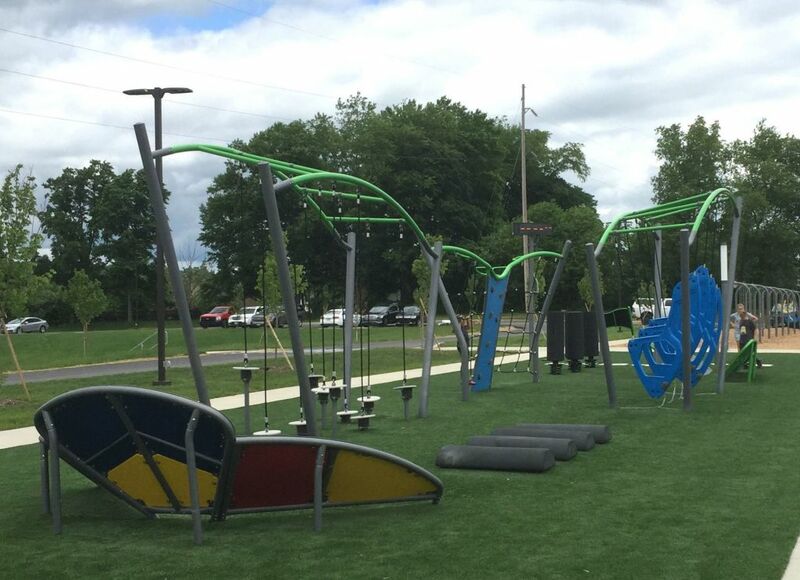 The 5-12 play area includes a fully ramped accessible GameTime Powerscape/Ionix Hybrid play structure with lots of fun and challenging climbing activities and Mini Sky Runner. The sensory area includes the GT Sensory Wave with adaptive switch technology, Merry-Go-ALL, melody chimes, cantana chimes and concert trio from Freenotes Harmony outdoor musical instruments. The fourth and final play area includes swings with belt, tot and both 2-5 and 5-12 Zero G adaptive seats. Three of the play areas include unique GameTime ShadowPlay® pieces. ShadowPlay® gives the playground another element while adding color, interest and fun. Those areas are completed with engineered wood fiber safety surfacing, surrounding walkways, site furnishings and shade. Valley Park has been designated as a PlayCORE National Demonstration Site for both the 7 Principles of Inclusive Playground Design and PlayOn! Promoting Physical Activity. This layout of uniquely designed play and fitness spaces adds to the inviting look of the entire park and community center, and will promote wellness and recreation within the community it serves. Valley Park will be the host city of this year’s WVRPA annual conference.